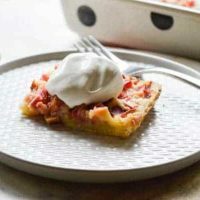 These Easy go Anywhere Rhubarb Squares pair my favorite bright, tart produce with a simple custard filling and a shortbread crust. Got rhubarb? Make Rhubarb Squares! And add whipped cream. Hurry hurry hurry! 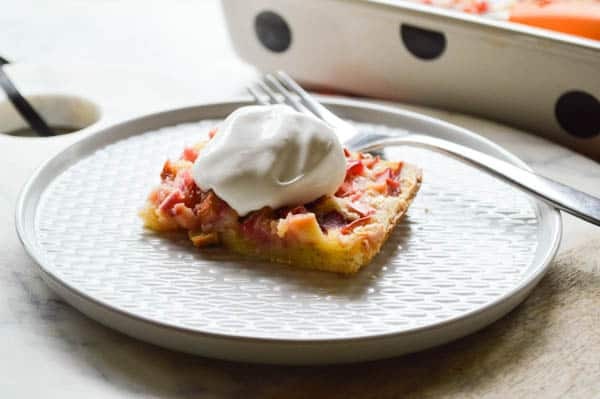 If you hurry you can still find rhubarb at your local stores and you won’t have to file away Easy Go Anywhere Rhubarb Squares away for next spring. 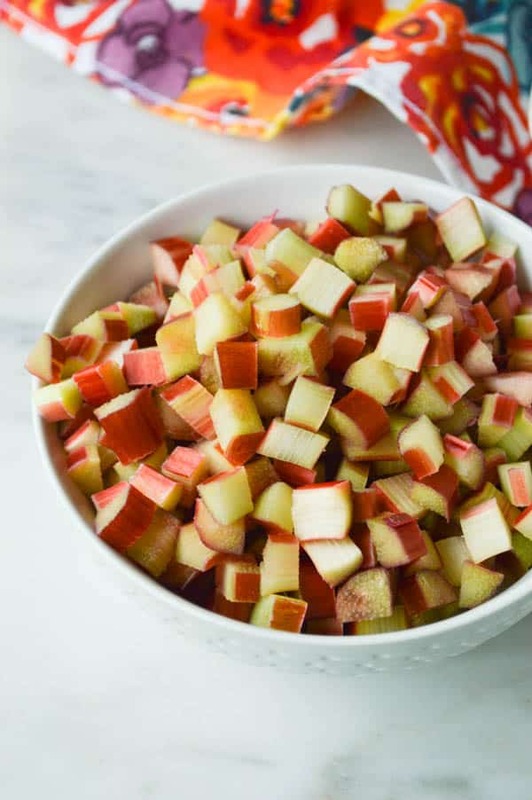 Honestly, if you live near a whole foods you probably don’t have to hurry at all and you can just have rhubarb any old time. But some of us (ahem … me) do not have that luxury. When rhubarb turns up in stores I cannot resist its hot pink celery-looking weirdness. 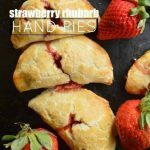 I only have one other recipe published with rhubarb, and it’s also a keeper – Strawberry Rhubarb Hand Pies. But they are just a tad bit more time consuming. This recipe calls for a shortbread crust. The popularity of this Truffle Frosted Shortbread is not lost on me. Nor is the popularity of the shortbread crust in this Bourbon Cheesecake with Boozy Chocolate for Two. I decided to forsake all graham crackers there – AND here. The shortbread is not super sweet. It’s just buttery and good so the produce can shine. I am boring myself with all this technical talk about Rhubarb Squares because honestly this recipe is super simple. 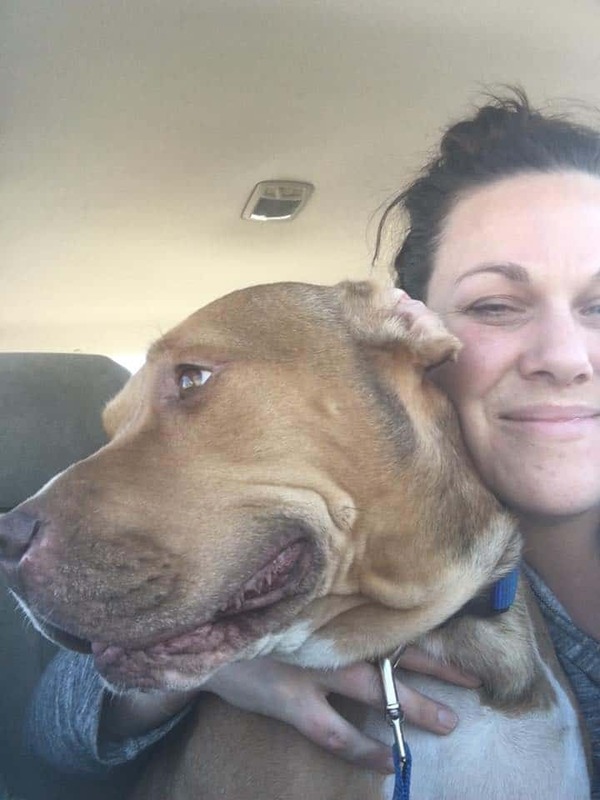 So let’s talk about dogs for a few, because I’d actually rather talk about dogs than food anyway. Duh. My brother has been here visiting since yesterday and Sawyer, A.K.A my best friend on earth, has decided that my brother requires all the supervision. I mean he’s not totally wrong, but like … not in this context. He doesn’t require supervision here in our house, or with dogs. Mostly he just needs supervision while driving. Or making major life decisions. You know, as most little brothers do. Anyway, since yesterday morning, every time anyone comes out of a room or walks through the house, or even just stands up from a seated position, Sawyer sounds the freaking alarm, and then he and Betty have a chorus of annoying barkfest. It is not my favorite. Maybe I didn’t want to talk about dogs as much as I just sort of wanted to complain. Thanks for humoring me. 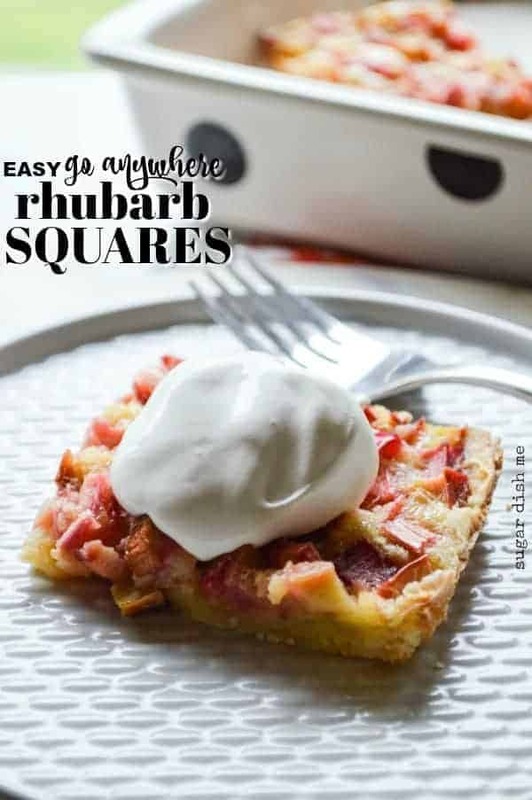 So easy Go Anywhere Rhubarb Squares. Make them. Love them. Take them with you to a potluck and show off your tart fruit + shortbread skills. Don’t forget the whipped cream. Or Cool Whip! Don’t hate. 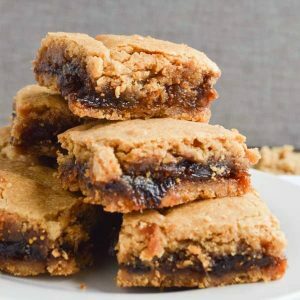 Fresh Fig Newtons! 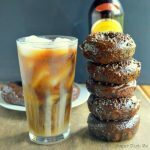 This is an old fashioned recipe that is popular every year when figs are in season. It was Chad’s grandpa’s favorite thing that I make, which is very high southern-farm-grandpa-with-mad-baking-skills praise. 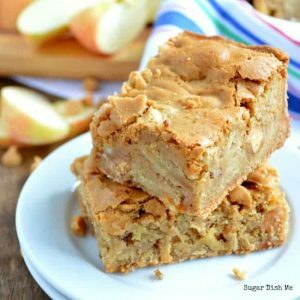 Chewy Apple Peanut Butter bars are EASY. Simple. Suuuuper delicious. And loaded with butter. You know – all the good dessert things. 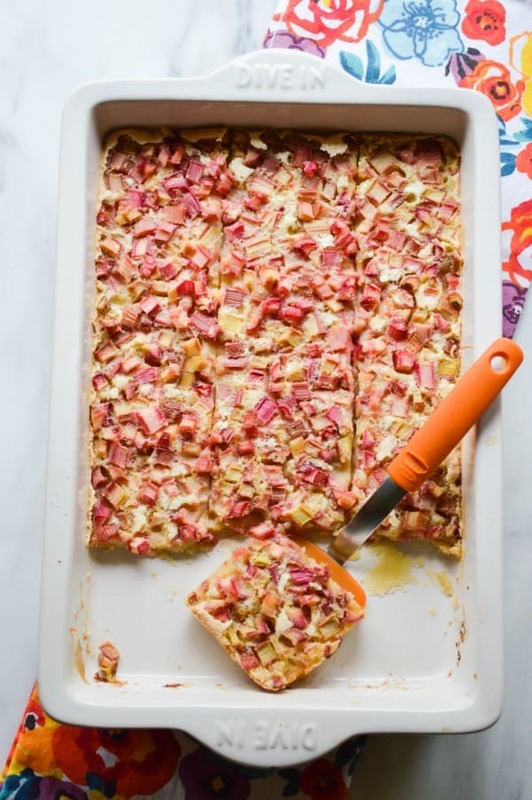 These Easy Go Anywhere Rhubarb Squares are sweet and tart and perfect for potlucks and picnics! Fresh rhubarb mixed with a few pantry staples poured over a cookie crust. Preheat the oven to 350°F. 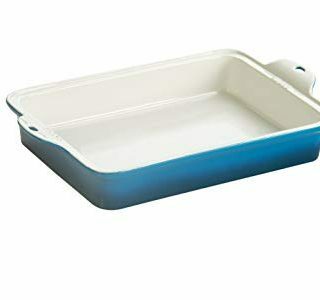 Butter a 9 X 13 baking dish, line it with parchment paper, and then butter the parchment paper. This helps the bars lift easily from the pan. Whisk together the flour, powdered sugar, and salt. Cut in the butter until coarse crumbs form. 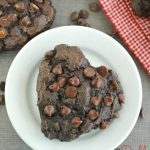 You can also use your food processor to cut in the butter and make this dough for the cookie crust. Press the dough evenly into the prepared pan. While the crust bakes, whisk together the sugar, flour, eggs and vanilla. Stir in the rhubarb. Pour the filling over the warm crust when you take it from the oven. Bake for another 35-40 minutes. If you insert a toothpick into the center it should come out clean. 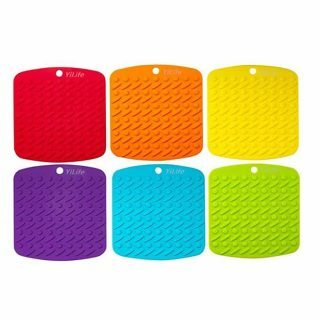 Cool and serve warm if you like! Otherwise cool completely and refrigerate until serving. To serve top with Cool whip or whipped cream. You can also use frozen rhubarb! 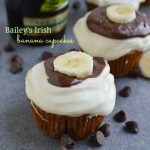 Opt for one with no added sugar. Recipe slightly adapted from Taste of Home Baking Classics. I love this book! 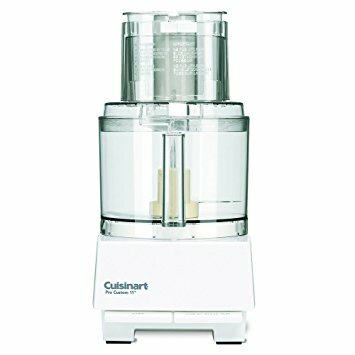 It's a terrific resource for basic, simple, recipes.